Ever since I saw the s'mores brownies in an issue of Cook's Country last year, I wanted to try them. Unfortunately, not only did I completely forget about them, but when I finally got around to trying the recipe, I didn't have any graham crackers to make the crust with. Rather than make my own grahams, I decided to go a different route by making rocky road brownies. After all, the thing that appealed most to me was the marshmallow topping, so the change from crust to nuts was not a big deal. Baking brownies turned out to be a good excuse to try my new pan: the Baker's Edge. Baker's Edge has an unusual, innovative design. As you can see from the picture below, there are extra edges running throughout the pan and their purpose is to evenly distribute the heat as your food bakes, eliminating soggy centers and overcooked edges. In a traditional pan, getting the timing just right can be a challenge, especially for sweets like brownies and cheesecakes, though the same holds true for savory casseroles and lasagnas. If you have never under- or over-baked anything, you're lying. I know I have. I mixed up the brownies and poured them into the pan. I topped the batter with chopped up pecans, even though walnuts are more traditionally used in rocky road, before baking. I like the flavor of pecans better, especially when sweets are concerned, and putting them on the top of the batter instead of stirring them in allowed them to toast slightly in the oven. Because the brownies were slightly thinner than they might otherwise have been , I reduced the baking time from the original recipe. So did the pan work? Were my brownies evenly done? Yes, and they were fantastic. The pan is made of heavy cast aluminum and has a nonstick coating, so I didn't even need to grease it before baking (though I probably would in the future, just to be on the safe side). The brownies were evenly cooked and slightly fudgy in the middle with crisp edges and a crackly crust. Each piece had the perfect ratio of crust to center. I'd say that in terms of brownie baking, this is easily the best pan I've ever used. The brownies just use melted chocolate, not cocoa powder, for flavor and were more chocolaty that I expected them to be. They were moist and tender, but not dense or heavy at all, as brownies made with melted chocolate can somtimes be. I used bittersweet chocolate rather than unsweetened and did not find the brownies to be too sweet, but I recommend using unsweetened rather than semi-sweet or another milder chocolate if you cannot find bittersweet. The nuts made a nice, slightly crunchy contrast to the base, but the marshmallows were still my favorite part. They browned up perfectly after only a few minutes under the broiler and were simply delicious, especially when they were still slightly warm. By the way, most recipes that fit a 9x9 or 9x13-inch pan will not have to be adjusted to use the Baker's Edge, so if you don't have one, you can make this recipe in a normal pan. Grease a 9x9 inch baking pan (or use the Baker's Edge) and set aside. 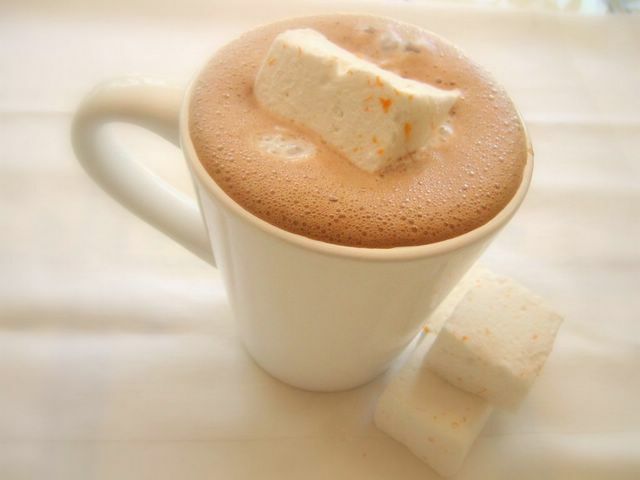 Melt together the butter and chocolate, heating it in brief intervals in the microwave and stirring frequently. Set aside to cool slightly, for about 2 minutes. In a large bowl, beat together sugar, baking powder, salt, eggs and vanilla until smooth. Quickly beat in the cooled butter mixture, then stir in the flour until the batter is just combined. Scrape into prepared pan and use a spatula to spread it evenly. Bake for 22-24 minutes (22 for the larger pan size). Turn on the broiler function in your oven. 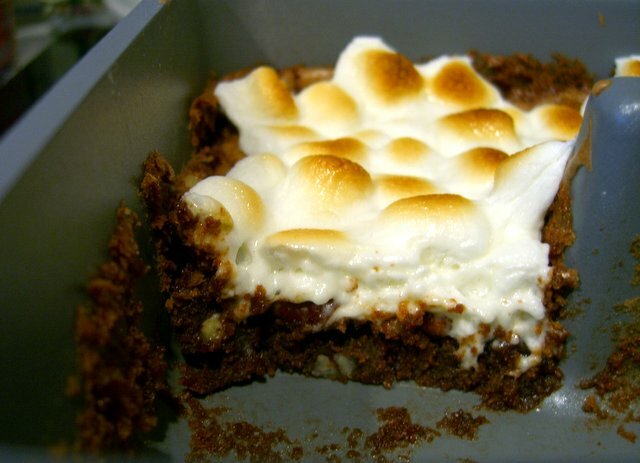 Top brownies evenly with the miniature marshmallows and broil for 2-3 minutes, turning the pan once, until marshmallows are evenly browned. 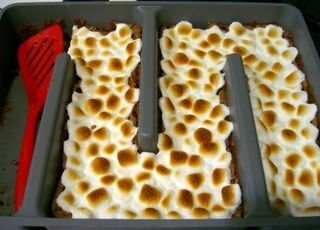 Cool the brownies in the pan before slicing and use a moisted knife to slice through them and prevent the marshmallow from sticking. 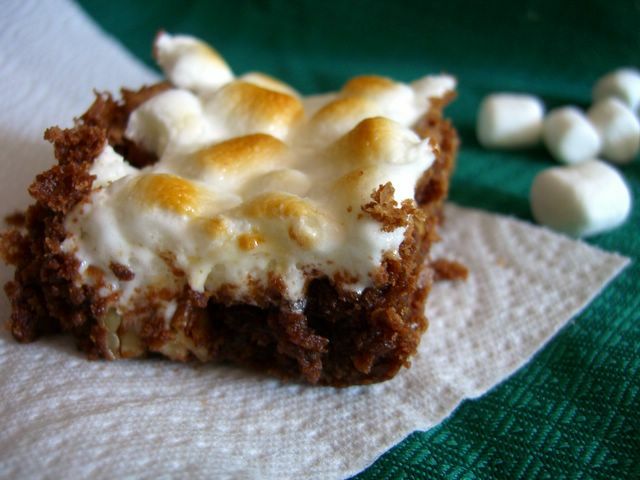 Note: You can leave off the marshmallows, if you wish, and just make the brownies with the pecans. Increase the nuts to 3/4 cup, if doing so.